The Stanford Graduate School of Business (also known as Stanford GSB or GSB) is the graduate business school of Stanford University in Stanford, California. Stanford GSB offers a general management Master of Business Administration (MBA) degree, the MSx Program (MS in Management for mid-career executives) and a Ph.D. program, along with joint degrees with other schools at Stanford including Earth Sciences, Education, Engineering, Law and Medicine. The school was founded in 1925 when trustee Herbert Hoover formed a committee of Wallace Alexander, George Rolph, Paul Shoup, Thomas Gregory, and Milton Esberg to secure the needed funds for the school's founding. Willard Hotchkiss became first dean of Stanford GSB. The library was formally inaugurated on April 3, 1933. The collection was established with 1,000 volumes and assorted reports. The school moved from Jordan Hall to new quarters in the History Corner of the Main Quad in 1937. Jonathan Levin was appointed as the 10th dean of the school in September 2016. Stanford Knight Management Center, seen from Serra Street. The Knight Management Center is situated within the greater Stanford campus. There are ten buildings at the Knight Management Center: the Gunn Building, Zambrano Hall, North Building, Arbuckle Dining Pavilion, Bass Center, the Faculty Buildings (comprising East and West buildings), the Patterson Building, the MBA Class of 1968 Building, and the McClelland Building. The Schwab Residential Center was designed by Mexican architect Ricardo Legorreta. The 158,000 square-foot facility consists of 280 guest rooms. There are three main art installations on campus, including Monument to Change as it Changes, Monument to the Unknown Variables, and Ways to Change. The GSB maintains very close links with the venture capital, finance and technology firms of nearby Silicon Valley. The school has approximately 400 students per year in its full-time two-year MBA program, which is considered the best in the world. In June 2006, the School announced a dramatic change to its curriculum model ("The Personalized MBA Education"). It aims to offer each student a highly customized experience by offering broader menus of course topics. The graduating class of 2009 was the first class having gone through the new curriculum. Current and past students include Fulbright Scholars, Marshall Scholars, Coro, Gardner, Soros, Rhodes, Rotary, and Truman fellows. Approximately 15% of the class entered the MBA program with other graduate or professional degrees; including medical doctors, lawyers, and Ph.Ds. Stanford GSB also offers a PhD in Management degree for those looking to pursue a career in academia. The students at the school have traditionally maintained a policy of grade non-disclosure whereby they do not release grades. Some annual academic distinctions do exist. Students graduating in the top ten percent of the class are designated "Arjay Miller Scholars", named after the former dean, Arjay Miller (1969–79). The top student receives the Henry Ford II award at graduation. At the end of the first year five students are also designated Siebel Scholars based on a combination of academics and extracurriculars. The Stanford MSx Program is a full-time, one-year master's degree program for managers in mid-career. Fellows who successfully complete the academic program are awarded the degree of Master of Science in Management. The program's principal objective is to help participants strengthen their capacity for organizational leadership. The ideal MSx candidate is a senior manager who has had or will soon be appointed to his or her first general management position. 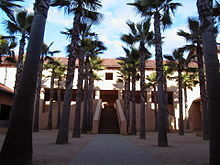 The Stanford MSx was previously called the Stanford Sloan Master's Program, because students in the program are known as Stanford Sloan Fellows. The Stanford MSx is one of the three Sloan Fellows programs, sharing a similar format with the others at the MIT Sloan School of Management and the London Business School. These programs were initially supported by Alfred P. Sloan, Chairman of General Motors from 1937 to 1956, who envisioned the Sloan Fellowship in his alma mater of MIT in 1931. The degree distinguishes itself from the MBA by acknowledging the life experiences of fellows. Like the MBA program, the MSx program requires a set of core courses along with electives (normally mixed with MBAs), however, the MSx program has separate core courses, more tailored for the experience level of fellows. Stanford GSB has a number of relationships with other leading business schools. It offers a number of Executive Education programs jointly with Harvard Business School. It also offers one of the three Sloan Fellows programs, coordinating with the others at the MIT Sloan School of Management and the London Business School. The school works at the forefront of global business research and teaching. There are three winners of the Nobel Memorial Prize in Economic Sciences on the faculty (William F. Sharpe 1990, Myron Scholes 1997, Michael Spence 2001), five recipients of the John Bates Clark Award, 19 members of the American Academy of Arts and Sciences, and four members of the National Academy of Sciences. William F. Sharpe's research interests focus on macro-investment analysis, equilibrium in capital markets and the provision of income in retirement. Myron Scholes’ research has focused on understanding uncertainty and its effect on asset prices and the value of options, including flexibility options. Michael Spence's research interests focus on the study of economic growth and development, dynamic competition and the economics of information. In 2017, GSB was tied for 4th by U.S. News & World Report No. 1 by Forbes, 1st by the Financial Times, 5th by The Economist, and 2nd by Bloomberg Businessweek. In the ranking aggregator Poets & Quants Stanford's MBA Program was ranked 2nd in the US. The Stanford Graduate School of Business is the most selective business school in the United States. It has maintained the highest ratio of "applicants to available seats" of any business school in the U.S. for the last decade. It has also had the lowest acceptance rates (typically <7%) of any business school. For the Class of 2018 which entered in 2016, 6% of applicants were offered admission, and the average GMAT score of 737 and average GPA of 3.73  are the highest of any business school in the United States. In August 2006, the school announced what was then the largest gift ever to a business school—$105 million from Stanford alumnus Phil Knight, MBA '62, co-founder and chairman of Nike, Inc. The gift went toward construction of a $375 million campus, called the Knight Management Center, for the business school. Construction was completed in 2011. The business school comprises the Knight Management Center, the Schwab Residential Center (named after alumnus Charles R. Schwab, founder and chairman of the Charles Schwab Corporation), and Highland Hall. There are 26,309 living alumni, including 17,803 alumni of the MBA program. Stanford Graduate School of Business is renowned to have produced a remarkable number of successful business leaders and entrepreneurs, many among the world's wealthiest, from its alumni base. ^ "Stanford Graduate School of Business: School Profile". Stanford University. Retrieved March 12, 2014. ^ "Stanford GSB Artwork | Stanford Graduate School of Business". Gsb.stanford.edu. Retrieved July 19, 2016. ^ Lawton-Smith, Helen (August 30, 2006). Universities, Innovation and the Economy. Taylor & Francis. ISBN 9780203358054 – via Google Books. ^ "Stanford MSx". Retrieved January 6, 2013. ^ "Stanford MSX Class of 2018 Profile". Retrieved December 25, 2017. ^ Stanford Graduate School of Business. "Stanford MSx Program". Stanford University. Retrieved August 9, 2012. ^ Bradshaw, Della (March 19, 2012). "A degree of choice for the older and wiser student". FT.com. Retrieved July 19, 2016. ^ "Global MBA Ranking". Financial Times. 2019. Retrieved January 31, 2019. ^ "2019 Best Undergraduate Business Programs Rankings". U.S. News & World Report. September 9, 2018. ^ "Stanford Tops 2015 List Of America's Best Business Schools". Forbes. Forbes. Retrieved February 6, 2016. ^ "Poets and Quants 2015 MBA Rankings". November 18, 2015. ^ Zlomek, Erin. (2013-04-18) India's IIM-A, the World's Toughest B-School to Get Into. Businessweek. Retrieved on 2013-08-12. ^ "Stanford GSB Entering Class Profile". Retrieved November 24, 2016. ^ "Nike Founder Phil Knight to Give $105 Million to Stanford GSB". Wikimedia Commons has media related to Stanford Graduate School of Business.